To have your message posted on the Notice Board email or ring the Administrator. Would all players please note that there is an error in the recently published fixture book. See page for Midweek games - 24th July - Delete "Stoke Park" and insert "Ewhurst" - Dress and timings remain the same. Got a couple of hours spare? We are looking for a working party to get the Club ready for playing outside. So please come along this Saturday 20th April at around 10am. The more members that turn out, the quicker we can have the green ready for a roll up. If you can help, please give Peter Smith a quick ring on 01483-233196. Calling all members - with the start of our 2019 season now just around the corner, the Pre-Season Bowls Meeting has been scheduled for Thursday 11th April, starting at 7.30pm in the clubhouse. All members are strongly encouraged to attend as you will have the opportunity to (a) pay your annual subscriptions, (b) sign up for the clubs internal competitions and (c) putting your names down for forthcoming friendly games. For those interested, there will also be the opportunity to enter your name as players in the Tuesday League (2 x Triples) games and/or for Thursday Mixed Triples League matches. The seasons forthcoming Tea Roster will be available on both the clubhouse notice board and on the changing room notice boards. An offical agenda for the meeting will be emailed to members shortly. Don't forget folks the fun Skittles Night this coming Saturday 30th March. All very welcome so bring along family and friends. Please don't forget The Annual General Meeting - Westfield & District Cricket & Sports Club to be held on Thursday 28th March at 8.00pm. Venue: Club house. All members are encouraged to attend for election of committee members and decisions regarding the way forward for the future. Appreciate a bit late in the day but we are desperately short of raffle prizes. If you have any suitable items or xmas or birthday gifts that you would like to donate, could you please bring them along tonight. Thank you. Would all those who wanted tickets for this coming Saturday's Rat Pack entertainment please note the due to a sell for the permormance, no further tickets are sadly available. Important date for your diary. The Annual General Meeting - Westfield & District Cricket & Sports Club will be held on Thursday 28th March at 8.00pm. Venue: Club house. All members are encouraged to attend for election of committee members and decisions regarding the way forward for the future. Please note that it is with regret that due to circumstances beyond my control that I have had cancel the Quiz night scheduled for this coming Saturday - 23rd February. Will look at the calendar and see if we can re-schedule at a later date depending upon availability. The weekend & mid-week Friendly Fixtures for the 2019 season are now available for viewing in the Club Diary. With the mad season now well behind us, we can look forward to bowling starting again outside. However, with the snow and cold weather still very much with us, we can look forward to an exciting fun packed programme of lively social events in the coming weeks. First up we have a trip down memory lane with a foot tapping evening of music from the 50’s & 60’s presented by the fabulous Phil Solo & Guest. So dig out your dancing shoes and book your place on the floor for a great night of lively entertainment. Date, just in case you forgot to put it in your diaries is Saturday 9th February, doors opening at 7.15pm. As always, we do need your help in knowing who is coming and who is not, if for no other reason in getting the buffet just right. So please, take a few minutes out and either drop us a quick line (zinccraft@aol.com) or a telephone call (01932 877615) as to whether you will be coming and what guest/friends will be joining us. Obviously, all most welcome…. the more the merrier. Wishing all our members, family and friends a very Happy New Year. May all your woods this coming season run true to that little white ball. We still have a few tickets left for the Annual Club Dinner on 12th January 2019. Don't be disappointed, get yours NOW. Available over the bar at the clubhouse or alternatively, ring 01932 877615 to book. For those already having booked their tickets, would you please make payment this coming Satuday at the Christmas Party. If making payment on the night of the Dinner, please note we can only accept cash - no cheques. Thank you. On the winter bowls front, our team from Westfield (Peter Collyer, Arthur Newman & Rob Todd) came away as the winners of the Shalford Winter League match play. The Funeral is to take place on Thursday 20th December 2018 at 12.30pm at Randalls Park Crematorium, Leatherhead, KT22 0AG. Cathy has asked no flowers please but if you would like to donate money, there will be a collection box at the crematorium which will be forwarded to the Salvation Army. Update: Following the funeral service, all are very welcome to come along to the Conservatory in Octagon Road, Whiteley Village between 2pm to 5pm and maybe raise a glass or two to Dave’s memory. It is with great sadness and a broken heart that I have to inform you that my darling Dave passed away peacefully at St Peter's Hospital at 9.15pm Friday night. The cancer in his lungs had spread into his blood stream and took over his whole body. I will in due course let you know what funeral arrangements I have made. I would like to thank you all for your kindness love and support you have given Dave and I throughout his illness, it has been a great comfort. We are introducing a Graffiti Board into the club house, the idea being that anybody can write a message on the board. This is especially pertinent at this time of the year where the board can be used to post Christmas messages/wishes rather than sending individual cards to friends and other members. Having written your message(s), you then make a donation other than spending the money on stamps etc. All monies raised in this fashion will then go to the Salvation Army, a worthy charity the club fully supports. I'm putting this appeal out to all members for donations for raffle prizes for the Christmas Party. Hopefully by now most of you will have seen my email explaining in detail what we are after. In short, we want to make the raffle special with a Christmas theme so are looking for prizes like; Xmas Pudding, Xmas Cake, Crackers, Tins of Sweets/Biscuits - I could go on but I think you get the idea. So while your shopping, please keep your eye out for a festive Xmas Party Raffle Prize which you hopefully will bring along to the party on the 15th December. Thank you. All club members I know want to wish our Wendy Todd, Dave Miller, Denise Joyce & Francis Joy our very best wishes, thoughts & prayers to be with you at this time. Obviously now in the winter months and little to report on the bowls front, thought I'd keep all up to date as to what is happening on the social entertainments horizon. Right, just around the corner on the 10th November we have another great nights entertainment lined up for you all with "Just Lee". With great music covering all taste, dance, sing along and tap your feet to a brilliant array of popular songs. To round off the evening, enjoy a super buffet supper. As always, Family & Friends all very welcome so the more the merrier. One for your diaries in the new year, our Annual Club Dinner has now been confirmed for 12th January 2019 at the Bird in the Hand public house at Mayford. Tickets will be on sale behind the bar with effect 15th December. So please get yours soonest so you won't be disappointed nearer the time. Click here to see dinner menu. Photographs from the Johnny Cash & Friends Evening held on 6th October have been posted in the Photo Gallery. Would all Westfield Bowls Members please note the Bowls Section AGM is scheduled to take place on this coming Thursday 11th October starting at 7.30pm. Agenda for the meeting has been sent out, including for Minutes of last meeting, Financials plus Surrey Competition forms being available. If you have an item(s) that you would like added to agenda, please contact Rob Todd (01483 612626) as soon as possible. Please make an effort to come along and support your club. Just in.... we've managed to engage at great expense Tony Murphy singing favorites from the Rat Pack's 40's, 50,s & 60's greatest hits plus many swing dance numbers. Definately not a night to miss so get it in your diraries now....... 16th March 2019. Couple of other dates in 2019 worth mentioning. Saturday 23rd February we have a Super Quiz Night and on Saturday 30th March, a Prize Money Fun Knock Out Skittles Challenge. Guest very welcome. For those members interested in how the club faired over the 2018 season, click here for a statastical breakdown. Members might like to know that the Jams, Pickles & Chutneys made by our Lesley raised £146.50 over our summer season 2018. This amount has been rounded up to £150.00 and will be presented to the Salvation Army as in previous years. Urgently need more voluntees to help put the green to bed this coming Monday 24th September starting at around 10am. Ladies your help would be appreciated in making the odd cup of tea to keep the workers watered and happy. It is with great sadness that we learn that Ellen, wife of our President - Danny Pott has pasted away. I know I express on behalf of all club members our deepest sympathy & condolences. Ellen was in the past a long standing member of the club both as a player and later as a social member. She will be greatly missed. Members might like to know that the funeral is to be held at Woking Crematorium on Friday 12th October at 2.45pm. I know all club members will join with me in wishing our Denise Joyce a very speedy recovery from her stroke and pray she returns to our fold soonest. With our Twilight Fun Bowls evening now only a couple of weeks away (Friday 21st September), important if your coming along to get your orders in for your Fish & Chip supper, including for any friends you are intending to bring along - More the merrier. Menu sheets have been posted both on the Entertainents Notice Board in the Club House and in the Bowls Changing Room. ALL ORDERS MUST BE IN BY 14TH OCTOBER. So, don't be disappointed, get your orders in NOW. If you can't get to the club, orders will be accepted by ringing 01932 877615. Rink 2 - The Ken Russell Shield with Lesley Hodge winning against Sean Brophy. Rink 3 - The Ossie Cup with Ken Rapley winning against Graham Thurley. Following a break for coffee/tea and biscuits, the next two matches got underway. Rink 2 - The Maggie Hedges Pairs with Sheila Osgood & Jim Thelton taking a close shot victory over Ken Rapley & Mike Mays. Rink 3 - The Eddie Mann Novice Cup with Bruce Atkin winning against Cathy Miller. Breaking for lunch of hot dogs, chicken & ham rolls, all garnished with wonderful pickles and chutneys, we were then treated to some tasty deserts all provided by our Lesley Hodge. With a welcome break, especially for those players having to play in more than one match, game got underway in the last of the finals with the Peter Smith taking on Jim Thelton in the Cracknell Cup - Men's Championship. Played on Rink 3 - The Cracknell Cup was taken by Peter Smith over Jim Thelton in an exciting game of reaching the magic 21 shots winning line. Although not played on this date, it has to be noted that two other competitions matches were played at an earlier date with the following results. The Willy Groves Trophy was won by Peter Smith and the Ladies Trophy was won by Lesley Hodge. In closing, the club offer Ken Rapley a big thank you for all the hard work he has put in over the season in organising and arranging our club competition games. Must also say thanks to all those members who took part in the competitions and other club members who shown their support throughout the season. 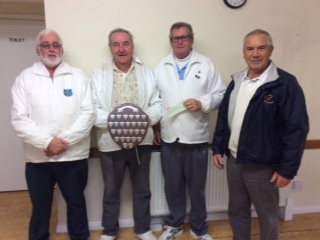 And finally, Westfield Bowls Club took the honours in winning the Area - Knaphill Triples Thursday League. Hopefully you will be aware that the forthcoming Victory Park match was changed from Away to Home. However, as of this morning its been changed back to Away for Saturday 8th September and the game scheduled for Saturday 29th September is now cancelled. Sorry to say it’s that time of the year again when our bowling season is coming to an end. It is now planned to make a start on the end of season works on Saturday 22nd September. I appreciate that there are still away matches that weekend but I hope to make a start so any players not in a match, please come along and help out. The full program is set out below. Saturday 22nd September. Intend to mow the green as short as possible and scarify in 3 directions. If possible depending on match selection availability 1 or 2 helpers would be nice. Any more than this, work to remove ditch linings and general tiding up could be undertaken, also the taking down the floodlights (3 man job). Sunday 23rd September. Hollow tine the green and remove the arisings. Again, depending on match selection availability 1 or 2 helpers would be nice. If not done, works to remove ditch linings and general tiding up could be undertaken, also the taking down the floodlights (3 man job). Monday 24th September is the heavy day starting around 10am, (as many helping hands as possible please) to spread the seed & 3 tonnes of top dressing. The green will need to be as dry as possible to aid the spreading of the dressing so I intend to be there early to brush the green and if necessary use a blower. We do have 2 blowers so will be seeking a volunteer to assist around 8am, any takers? As usual, please bring your gloves and if you have, shovels, wheelbarrows (borrow one?) and general gardening tools would be most helpful. My I request the ladies get together on Monday to supply us with drinks and nibbles (happy to pay for them) and see what lighter duties are needed to be undertaken. (Pre-school will be in operation so clubhouse is out of bounds). Of cause all subject to the weather being kind to us?, if not, works to be undertaken asap thereafter so as to allow time for the seed to get established before the colder weather sets in. Please can you let me know your availability for the above dates and in particular do you have (borrow) a wheelbarrow? Most important pieces of equipment for moving 3 tonnes of dressing. Finally, need 2 or 3 volunteers to set up the lighting for our Twilight Bowls fun Evening sheduled for 21st September. Intend to test the equipment and make sure it works on Wednesday 19th (time to be agreed) then set up the lighting poles against the hedge and fencing. Again, please give me a ring asp on 01483 233408. Would be helpful if anybody not playing in a final could be available at around 9am to help set up the green	etc. With finals weekend now just around the corner this coming Saturday/Sunday 1st/2nd September, whether you are playing in a final or not, why not come along to the club and cheer on those playing. Lesley once again will be providing eats in the form of sausage & onion rolls and chicken rolls plus of course her tasty desserts. Not a weekend to be missed. So, if you are thinking of coming along or actually playing, would you please give Lesley a ring or email so she knows how much food to provide. Dave Miller would like to thank all those members for their kind words, cards and get well wishes. Home now and itching to get back on the green. Thank you once again. I know all club members will want to wish our Dave Miller a very speedy recovery from his stay in hospital and return to the bowls green very soon. Please be aware that the green has recently been treated with various sprays for weeds and fertiliser. Should you be playing over the next couple of days, please make sure to wash your hands afterwards. Urgently need more players for the away game against West End on 22nd August starting at 6.00pm. If you can play, please put your names down on the sheets in club house or alternatively, please give Peter Smith or Cathy Miller at ring asp. Please note the game against Bramley BC scheduled for Sunday 12th August at home has been reduced to only 3 x Triples. For rearranged selections, please click here. All players please note the home game scheduled for Wednesday 8th August against Wonersh BC has been called off by Wonersh. The Willy Groves competition was played on Saturday 4th August and judged a great success by all concerned. Although played in a blazing heat, all sixteen players who started out playing three games each in a round robin knock out, came down by the end of the day with Peter Smith pipping Arthur Newman in the final. We must say a big thank you to Ken Rapley who did a splendid job organising the competition and Lesley Hodge for providing a very refeshing lunch. A good day alround. All players please note the home game scheduled for Sunday 5th August against Cove BC has been cancelled. The Willy Groves internal competition will be played on Saturday 4th August rolling off at 10.0am. All competitors (see players here) are asked to arrive no later than 9.45am. Food will be available throughout the day at a small charge plus Bar open all day. The away game against Ewhurst BC scheduled this coming Wednesay has been cancelled due to the expected extreme high heat forecast. For all those playing away this coming Friday 20th July at Witterings & District Bowls Club, would you please ensure you arrive at the club by 1.30pm latest for 2.00pm start. Just a reminder that fees for the game, including a cream tea is £5.00per head, visitors £2.00. To view team/player selections for this game, click here. If anybody is still looking for a lift there and back, give Bruce a ring on 01932-877615. Being as most members are playing away at The Witterings on Friday 20th July, Open Club Night is cancelled. Those members not going to Witterings are very welcome to come along for a roll up, or alternatively, the evening would be a good opportunity to play those competition games to be completed by the 29th July. We'er short of players for forthcoming matches. For those members available, would you please put your names down on sheets in clubhouse or give Cathy Miller a ring. Unfortunately, the scheduled game against Merrow this coming Sunday has been cancelled as Merrow are not able to furnish a team due to the World Cup football final. Please note changes to player selections for the game on 7th July against Elstead (Home) & 11th July against Milford (Away). Reminder for the away game against the Witterings (Post Code: PO20 8NS) on Friday 20th July at 2.00pm - Dress: Whites. If you've not got your name down yet, could you do so asp as we need to contact the club next week with regards to catering needs. The cost for players, including a cream tea plus your green fees will be £5.00. In addition, if you would like to bring along a visitor(s) then we need to know numbers at approximate cost of £3.00 pp. Team/Player selections for friendly matches have now been posted for games between 30th June thro to 11th July. To see if you have been selected, goto Selections. For those playing in the match against Burpham this coming Wednesday, please note that the game is Away and not at home as originally recorded. Team/Player selections for friendly matches have now been posted for games between 23rd June thro to 4th July. To see if you have been selected, goto Selections. Please note that due holiday commitments, no further updates to the web site will be carried out but held over to 18th June. During this period, all members should consult either club emails or pursue the notice board at the club house. The club has received a couple of invitations: The first from Tongham Bowling Club to play in the Arthur Williams Day tournament scheduled in three weeks time (sorry don't have the actual date at this point in time). It's teams of three playing a number of Triples games at a cost of £24 per team. This includes lunch and tea plus your green fees. Anybody interested, please give Rob Todd a call. Second invite is to the Woking Park Invitation Mixed Fours Competition to be played on 1st July starting at 9.30am. Entry fees are £40,00 per team which includes lunch, tea/coffee all day and afternoon cake. As above, if your interested in playing as part of a team, please give Rob Todd a call. In both cases, entry places are limited so you need to call asp. Looking to setting up a Texas Holdum Poker Night on the next Open Club Night on the 1st June. So besides coming along for a roll up, few drinks at the bar and catch up with friends, why not play a few hands of cards and maybe win some cash. No fee to show up but £10 entry stake that goes into the prize fund. Anybody interested in having a go, could they please email me direct at briza2511@aol.com or give me a bell on 07532 221577. Helpful to know numbers interested so we can set up the relevant number of tables and get enough chips. (If anyone has a set of poker chips, can we borrow them). Obviously, family and friends very welcome whether to either have a go at bowls or just play poker so please come along and support our Club. The home game against West Byfleet - Saturday 19th May has been changed from Triples to Rinks and therefore player selections have been amended. To view, goto Selections. Don't forget folks that this Sunday - 6th May is Open Drive Day. Come along for a roll up, catch up and chat with friends and a drink in the sunshine. The weather has certainly not be kind to us as our green is still unplayable due to the heavy rain. I expect like me, many of you are chopping to have a "roll up" after the long winter break. John Osgood assures me that directly the green drys a bit and he can get it cut, we will all be able to dust off our woods and get rolling. Now praying the weather does improve over the next couple of days as we are still short of players for the 12th, 13th and 14th May so please get you names down.